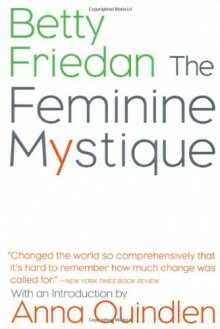 The book that changed the consciousness of a country—and the world.Landmark, groundbreaking, classic—these adjectives barely describe the earthshaking and long-lasting effects of Betty Friedan's The Feminine Mystique. This is the book that defined "the problem that has no name," that launched the Second Wave of the feminist movement, and has been awakening women and men with its insights into social relations, which still remain fresh, ever since. A national bestseller, with over 1 million copies sold. As for so many other women, changed my life. It's a history book, and one every woman should read to get a sense of what has come before her, and the life she has.